Derby 134 is made from a brown material with black button eyes and a white “stripe” on his face. 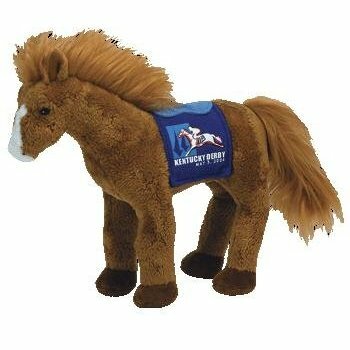 He has a fluffy brown mane and tail and on his back is a blue saddle pad with the Kentucky Derby 134 logo on it. Derby 134 was released in this blue saddle retail version, a Kentucky Derby store blue saddle version, a pink saddle version and a Kentucky Derby store pink saddle version. He was retired on 30th October 2009.